This is a Beautiful ceramic wall plaque, produced in Vallauris, France circa 1957 by the Helene Ugo Pottery, decor by Michel Barbier. 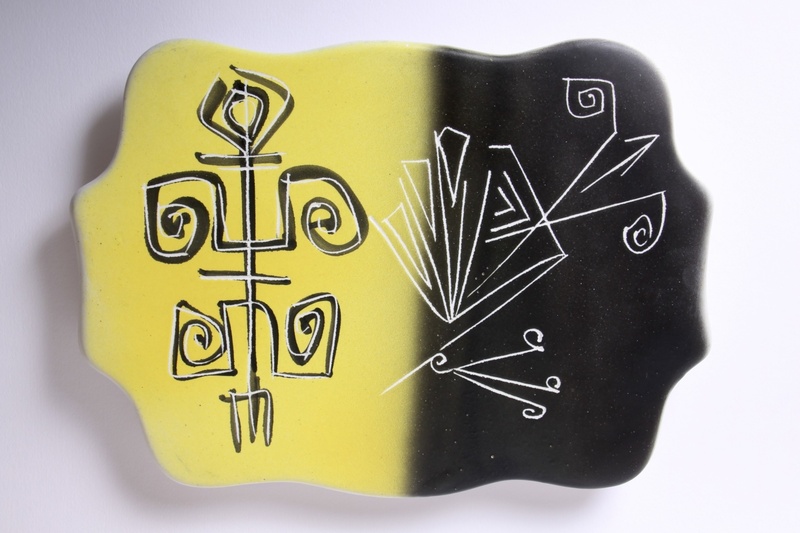 A Stunning Mid Century Modernist piece of Abstract / Picasso inspired French Art Pottery. 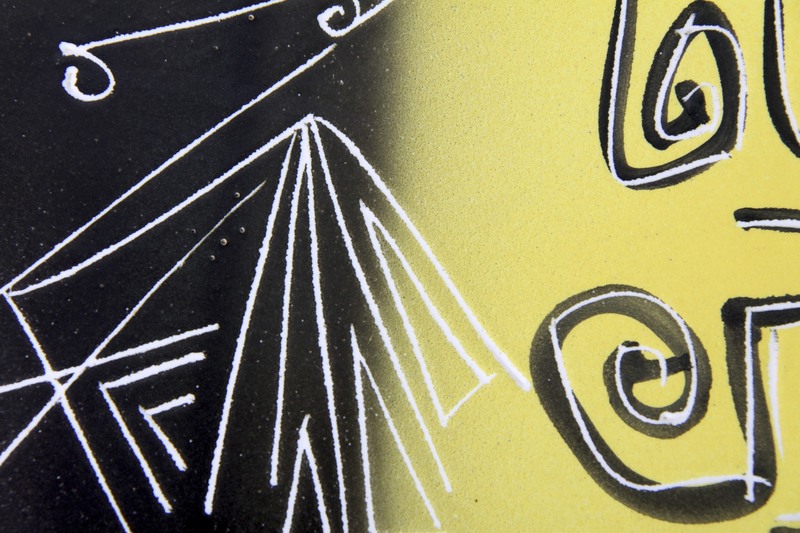 Hand incised and painted pattern in a delightful bold Cubist design, with matte black and yellow glazes with a lovely smooth pumice / pebble feel and texture. Vallauris is a pottery region in south-eastern France, Picasso lived here from 1948 – 55 and greatly contributed to the renaissance of the pottery industry, this legendary golden age when everyone was a potter, including famous ceramicists Roger Capron and Charles Voltz. His influence is clearly seen in the abstracted forms of pieces such as this plaque. Would make a Fantastic addition to any collection of European / French / Studio / Art Pottery and is a perfect Bright statement piece to decorate any wall in a retro, vintage, mid century modern, 50’s, minimal or contemporary interior. In Very Good Condition, one small bruise to the glaze on one corner, and some marks to the white glaze on sides and rear so do not detract from the overall look. Measures 32 x 22 x 1.6cm / 12.5 x 8.75 x 0.6in. Stamped (indistinct) to the back with Made in France and Helene Ugo Vallauris, hand signed in black paint Vallauris and M?D. 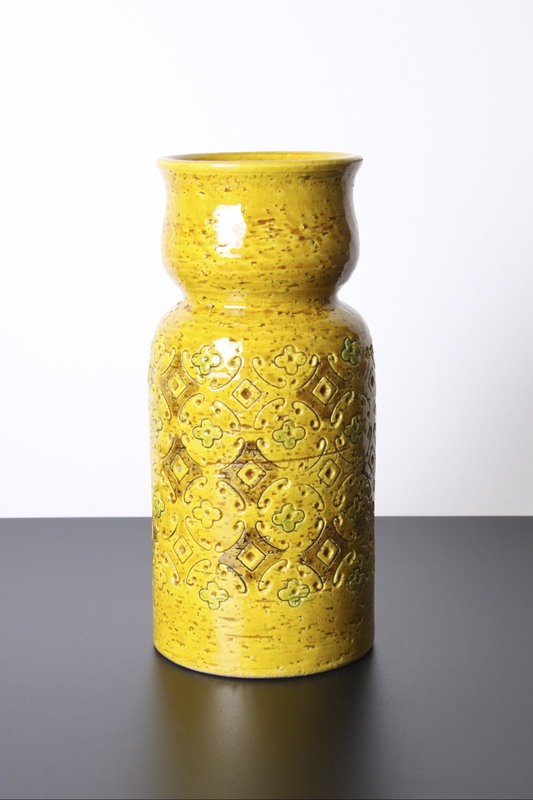 This is a Beautiful Bitossi Ceramic ‘Spagnolo’ vase, Italy circa 1960’s. A Great design, the baluster form is made of clay with crushed granules to give a rough texture. The recurring ‘Spagnolo’ (Spanish) motifs are impressed into the surface and picked out in brown and green on a glossy yellow glazed base. A Fabulous piece designed by Aldo Londi, a striking style very different to the iconic ‘Rimini Blu’, this design was influenced by Moorish tiles, as they were influenced by emerging cultural trends and Mediterranean historical ceramics. would make a Fantastic practical vase or display piece, and would look great in any 60’s, retro, vintage, mid century modern, modernist, minimal or contemporary interior. A Great addition to any collection of Bitossi / Italian / European art pottery or 20th century design. Not marked to the base, as is common with these pieces. Measures 21 x 10 x 10cm / 8 x 4 x 4in. 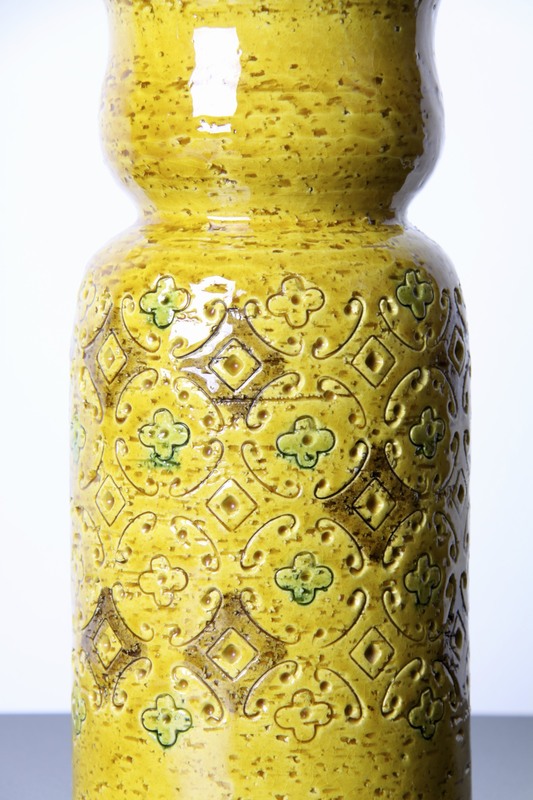 This is a Great Fratelli Fanciullacci baluster vase, Italy circa 1960’s. A Beautiful piece from one of the leading postwar Italian potteries. Their modern styles were inspired by the art movement and new ceramic designs of the mid century era. Their designs reflected the growth in European studio pottery, and were similarly entirely handmade. The clean-lined geometric form, with the conical neck is accentuated by the two bands of carved and glazed motifs. Brightly coloured in green and orange glossy glazes, they jump out from the pumice like, textured, black and white background, which has repeated impressed square dots adding to the decor. A Wonderful vase, stylish and colourful, the same form with a different glaze can be seen on p.129 of Mark Hill’s ‘Alla Moda’ Italian Ceramics book. Would make a Fantastic addition to any collection of Italian / European / Studio / Fat Lava pottery, and would complement any retro, vintage, 60’s, mid century, modernist, minimal or contemporary interior. Hand marked to the base 8627 ITALY. Measures 25.5 x 12 x 12cm / 10 x 4.75 x 4.75in. This is a Stunning Rare and Unusual Ruscha Keramik vase 320/2, West Germany circa 1960’s. Ruscha was founded in 1948 by Rudolph Schardt and produced high quality pieces, they were renowned for their early experiments with glazes such as the ‘Vulkano’ glaze from 1959 one of the first ‘Fat Lava’ glazes. This classic stylish form was designed by Heinz Siery, the bulbous body topped with a beautifully proportioned decorative handle and small neck. The mottled matte glaze has turquoise, blue , grey and black colours and a fine pumice like texture. The motifs are tube lined in black and suggest stylised Japanese characters. Giving a very Mid Century Modern Oriental / Asian inspired look to the vase. Would make a Great addition to any collection of West German / Fat Lava / European pottery, and would complement any retro, vintage, mid century, 60’s, minimal or contemporary interior. In Excellent Condition, no marks, chips or scratches, there is one small hole in the tube lined glaze, probably from production, in the last photo. Marked to the base 320/2 with indistinct stamped black lettering. Measures 18 x 12 x 12cm / 7 x 4.75 x 4.75in.